Houses are sagging in Longyearbyen and the unstable ground around the famous seed vault is now frozen artificially while the entrance to the tunnel is being re-built. 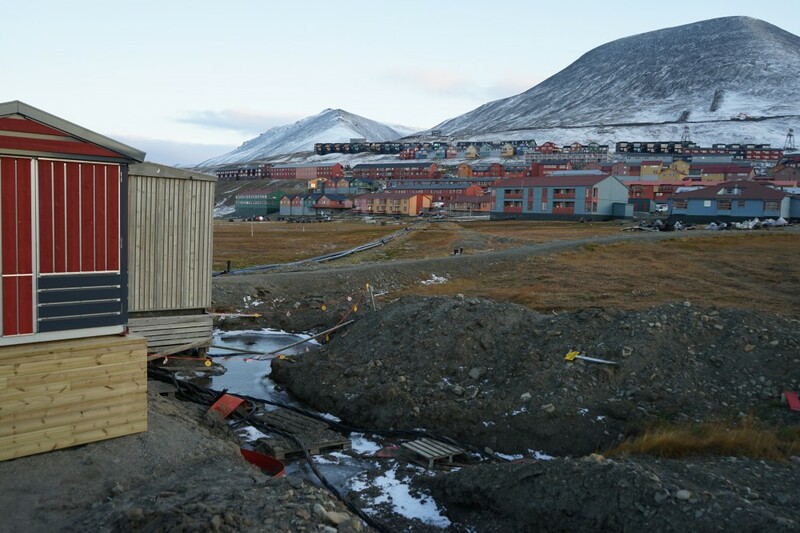 Climate changes are literally destabilizing homes on Norway’s Svalbard archipelago. Traditionally, buildings in Longyearbyen are built on wooden stacks resting on what used to be frozen permafrost. Now, about 250 homes will have to be torn down, Aftenposten reports. For a town of 2,200 people, that is a lot. Melting permafrost has cause troubles for buildings, infrastructure and coastal erosions throughout the circumpolar north. But the speed of the problem so far north as Longyearbyen, 1300 kilometers beyond the Arctic Circle has surprised everyone. Temperatures in the Arctic continue to soar. For 2017, average temperatures in Longyearbyen were 4,5°C higher than normal. While the UN Climate Panel this week issued a report urging world leaders to take action to limit global average warming to 1.5°C, the same scientists concludes that the Arctic is already warming two to three times higher. Over the last 94 months, temperatures measured at Longyearbyen airport have been above average since measurements started in 1936. This year, spring came abnormally early, with a mean temperature of 1,8°C in May. That is 6°C above normal in a month where the frost should still remain. No strange the ground is melting underneath people’s houses. Permafrost is defined as ground where the temperature is below zero degrees Celsius for a minimum two years in succession. 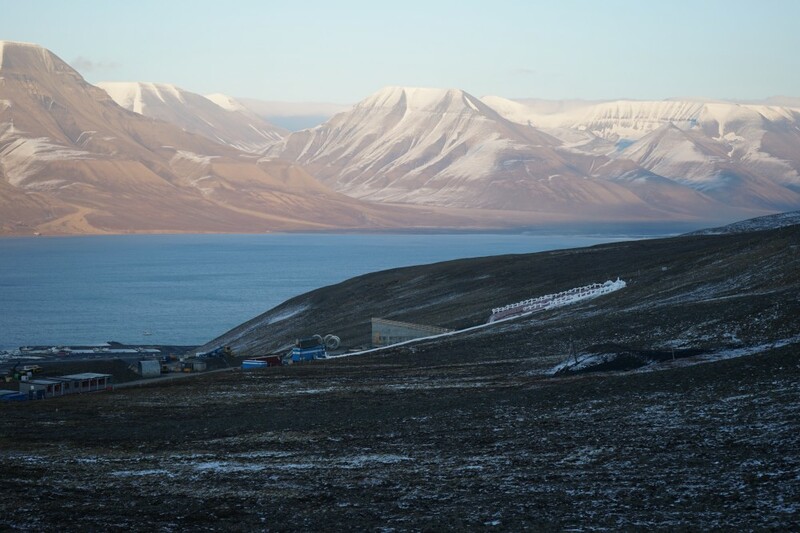 In summer at Svalbard, the upper one-meter of soil thaws and plants can grow. It is this one-meter that now melts deeper, making the traditional wooden pillars houses in Longyearbyen are build on unstable. Two snow avalanches and landslides, in 2015 and 2017, is another reason some houses nearest to the steep mountain have to be moved. The avalanches are also linked to climate changes as the snow piles and warmer weather cause higher risk for avalanches. Three new apartments-blocks are currently being built under supervision by Statsbygg, the Norwegian government’s building commissioner. 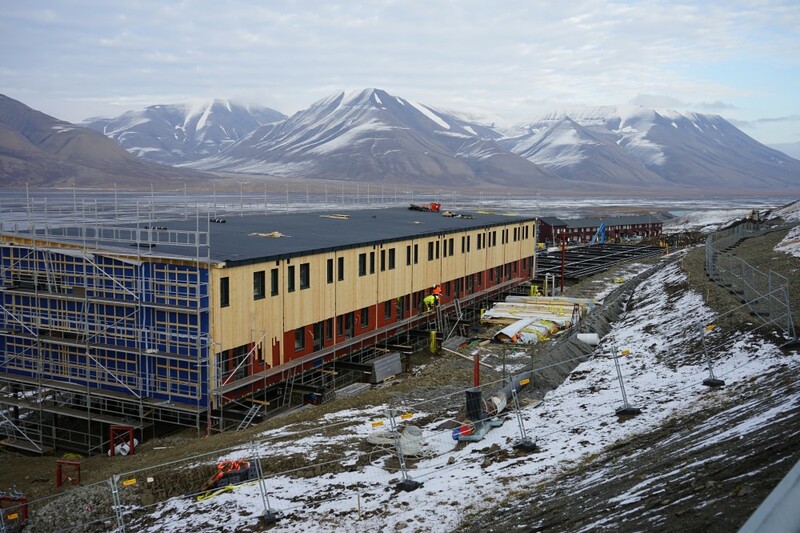 The government has granted 220 million kroner (€23 million) for new houses in Longyearbyen. “We are using this project to gain new knowledge for building houses,” says head of communication with Statsbygg, Hege Njaa Aschim to Svalbardposten, the local newspaper. Sensors are places in the ground to measure how the steel constructions impact the permafrost. This knowledge will be used when more houses will be built. The three blocks currently under construction will house 60 apartments at a total of 8,000 square meters. In the mountain above Longyearbyen airport is another reconstruction project a clear witness of the dramatic affects from thawing permafrost. 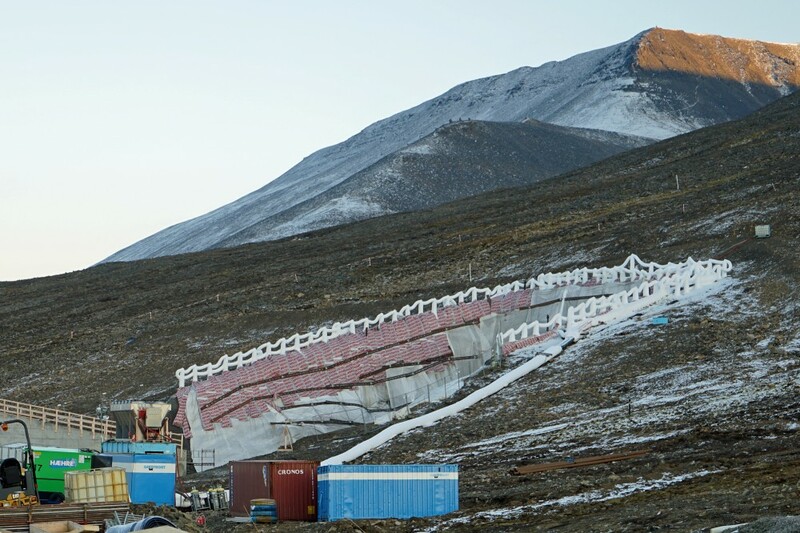 The entrance to the Global Seed Vault, where some 45,000 international varieties are stored deep into the mountain, is being rebuilt. Climate change has caused more snow and rain and the entrance has been flooded several times. Although built only 10 years ago, nobody at that time anticipated the water troubles could be so severe. During reconstruction, the ground around the new waterproof entrence is artificially frozen to avoid further erosion. Big white-frozen pipes are visible in long distance from the vault, stabilizing a five meters thick and 20 meters high ice-wall. The tunnel from the entrance into the mountain will be made much smaller than the original one, only three meters in diameter. All heat sources in the vault have been moved out and will be placed in a separate service building to be built next to the vault, while extra cooling capacities will be installed inside the mountain. The freezing elements will be removed when stones and rocks again covers the entrance area. Reconstruction will be completed in May 2019.